Ways to empower your child in the world and much more! 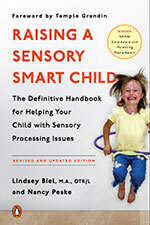 Lindsey Biel’s new sensory strategies book for clinical psychologists, social workers, teachers, parents and others is now available. See the Sensory Processing Challenges web site for more information and for downloable sensory screening tools for home and school. April 30 - May 3 - the 16th Annual Young Child Expo & Conference, New York City. For more information, please visit Young Child Expo. May 3 - Sensory Friendly Art Works! NY Academy of Medicine/Adapt Community Network Autism Summit. For more information, please visit Adapt Community Network or call 718-436-7979 Ext. 704. May 7 - Maximizing Vision and Visual Processing Skills, TheraMoves evening workshop, Brooklyn NY. For more information, please visit TheraMoves. May 8 - Health Class Podcast. May 28 - Maximizing Vision and Visual Processing Skills, LibertyPOST/Watch Me Grow evening workshop, Manhattan. For more information, please visit Watch Me Grow. June 5 - “The Sleep Lady” Sleep Coach training. Sorry, this session is not open to the public. June 6- Building Graphomotor and Fine Motor Skills. Staff training, Westside Preschool, Manhattan (Adapt Community Network). Sorry, this session is not open to the public. June 23 - Sensory Smart™ Strategies for Real-Life Challenges, LibertyPOST/Watch Me Grow workshop, Manhattan. For more information, please visit Watch Me Grow. November 8 - TECA Conference (Twice Exceptional Children’s Advocacy), Molloy College, Rockville Centre, NY. More information to come. Visit TECA. Fall 2019 - Fort Worth TX and Dyer IN. Watch for further announcements! Six hours (2 DVDs) of practical information on behavior, emotion, and learning in children with sensory processing difficulties with Lindsey Biel and Drs. Brock and Fernette Eide. Check here for free webcasts and Lindsey’s articles on sensory overload, noise sensitivity, sensory diet, sensory-friendly clothing, picky eating, sleep difficulties and more.